Leaky pipes? Water damage is next! Water can be a very destructive force inside your home. And it doesn’t even have to be in the form of flooding. Slow, steady, leaks can be just as serious over time. Often they occur in places that are hidden from view, where they do their work undetected for long periods. To prevent extensive damage, it’s a good idea to periodically do a leak inspection. Here are some areas that should definitely be on your checklist. Inspect pipes anywhere they are exposed: under sinks in the kitchen and bathrooms, in the laundry room, and in the basement. Check for active leaks, but also look for staining that may indicate a periodic leak, damage to caulking, and missing grout. 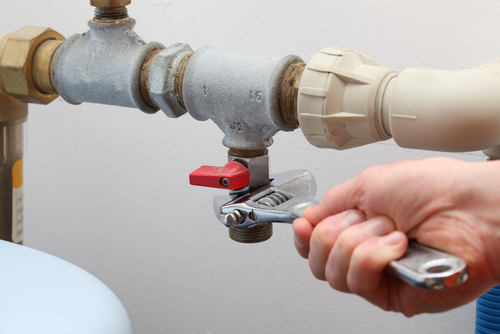 Examine your water heater looking for spots on the floor or signs of rust that may indicate problems ahead. Look for streaks and stains on walls and ceilings. Even just a few small spots can be a sign of a problem, and an indication you should look more closely. They may point to a leaky pipe behind a wall. Also look for cracks or soft spots in drywall for the same reason. Warping of floors or floor coverings is typically a sign of a water problem. A musty smell or light or dark spots of mold are a red flag as well. And if the damage you find is on the main or upper levels, you should look very closely at the ceiling and walls in that area on the floor below. The inspection points above apply to the basement as well, but be especially vigilant when you inspect it as it’s a frequent site of water damage. And leaks in unfinished basements can be especially problematic as those spaces are often used to store belongings. The attic is another area where water damage is common due to roof leaks. Look closely at the point where the roof meets the walls, and in areas where two roof sections coming together forms a valley. Rain or snow melt channeled here can wear out shingles more quickly, making the spot more prone to leaks. In cold climates, these areas can also develop ice dams in the winter that trap water, giving it more time to do damage. Check your roof for damaged, cracked, warped, or missing shingles. Examine gutters and downspouts to ensure they are in good condition and unblocked. If you discover signs of leaky pipes or water damage in general, it’s best to get an expert opinion on the situation as soon as possible. Acting promptly can prevent further damage.